One of the film’s most intriguing characters is Zero, a supercomputer that holds the sum total of human knowledge. Lead rollerballers Jonathan E. (James Caan) and Moonpie (John Beck) approach Zero seeking information about the Corporate Wars, but are unable to penetrate its mysterious watery database to find the answers. Sadly, those who control Zero have erased, in some cases, entire centuries of knowledge to cover up inconvenient truths. As I wrote in one of my recent Stratecast reports, I doubt Jewison, Caan and their cinematic colleagues realized it as such, but this movie, now nearly four decades old, shone a light on best practices associated with Big Data and analytics—through a computerized character that violated every one of them. Probably no surprise that someone who could distill Big Data out of the movie Rollerball would include The Social Network in his current theatrical triumvirate. I think we all see ourselves somewhere along the fun yet terrifying, slip-and-slide continuum of social and business structures flashing across nearly every scene. We are at first enthralled at our fly-on-the-wall stolen (there’s that word) glimpses of the wrenching, anesthesia-less birth of one of the most important social phenomena of our time. Then somewhere deep within our souls, we stir fitfully in the night wondering what multibillion-dollar idea we ourselves may be leaving on the table. Or whether life is passing us by. We’ve all been a part of groups where friendships and alliances wax and wane with the phases of the moon, but here, membership was for all the marbles. Somewhere between Jesse Eisenberg’s riveting, haunting, warp-speed Zuckerberg and Andy Samberg’s nervous-laughter-emitting version at Harvard I caught glimpses of…myself. (Update my status to legally insane.) Those charming moments of heated discussion when I’m in that “These are the facts these are the only facts and they’re the same facts today as they were yesterday so I’m amazed that you’re here wasting a single brain cell considering even for a nanosecond any other facts” zone. It’s a zone those closest to me have come to know and love, or tolerate, or for all I know have taken to stealing away (there’s a form of that word again) for a little target practice with a high-powered weapon, biding** their time until The Big Day. Manic like Zuckerberg but without the billion$. Yep, those closest to me get all the insanity but not the centuries of financial security. * The 2002 remake of Rollerball simply, for reasons too many to list, does not exist. 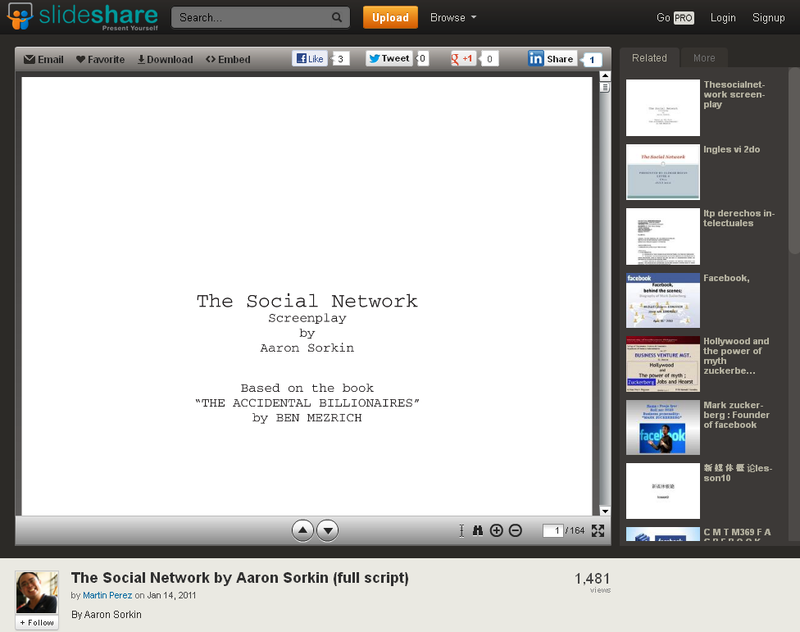 ◊ Cannot believe Aaron Sorkin posted his entire script for The Social Network right there on Slideshare for all to see, but there it is nonetheless. Enjoy. And thank you, Aaron, for giving us a gift of epic proportions…again.